The IMVC Calendar is finally here. Any member can post any event relating to medical volunteerism on the calendar. I think that this is a step towards IMVC.org becoming the true home of medical volunteerism on the internet. Today was the last day of my final exams for my junior year of college. My junior year has come and gone, and so has the first conference. But, studying and working on the website will still remain part of my schedule. I will be taking the MCAT in July and the website still needs much work. I've redesigned some major parts of the website. The information from the old conference is now under the Past Conferences tab. I believe that this makes it easier to find everything (especially for new users). I made an overview page using Flash. This is my second Flash project. The overview is mainly for new users, but I think that all people will enjoy seeing it. The pictures on the conference tab of the overview are put in an automated gallery. The pictures will expand and the motion will stop when you click on the pictures and then go back to normal with a second click. This overview still needs more work, but I think that it's a good start. The video recordings are in a physical tape format and it will be a while until this is all prepared. Photos and summaries will most likely come earlier. I can understand if people are impatient about this since I want to see the videos also (I don't have access to the video recordings, by the way). Since the speaker sessions were concurrent, nobody saw all the videos. In the meantime... an update on the televised session on healthcare reform (the We Speak! session) will be made in May and the forum is the place where the discussions are continuing for all the sessions. Today is the first day of the international medical volunteerism conference! I have my PowerPoint ready for F5 to be pressed and I'm about to get ready to drive to Emory. The opening session will take place at Glenn Memorial Church and it will last from 7 pm to 10 pm. Over 1,000 people are expected to be present and I hope to see you (the reader) there! The date of the conference is quickly approaching. The conference and the website have both had tremendous growth in the last few weeks. I'm very happy that the usage of this website's social networking features have increased. I hope to convince all the other visitors to join in with my presentation in the opening session. I'll now get back to studying. I'm almost done with my last round of midterms and the website will probably need to be worked on a lot more next week. I'm very happy with the steady growth of the website. As of today, there have been over 20,000 clicks and people from over 55 different countries have accessed the site. The website has a very high search engine ranking and is in the top 25 under 'volunteerism' for certain search engines. I think that this is amazing considering how many other volunteerism websites and non-medical volunteer activities exist. You may have noticed a bar at the bottom of the home page. If you are a member of a social network such as Facebook and Myspace, you can actually sign in with the bar and chat with your Facebook and Myspace friends while you are on this website. If you have AIM, you can even video chat. The Twitter button lets you see any Twitter posts that contain the words 'medical volunteerism' and the Facebook button allows you to become a fan on Facebook (there is a group and a fan page on Facebook). As always, if you have any questions about the website feel free to contact me at marijanpejic@yahoo.com. Also, here is a map of visitors. 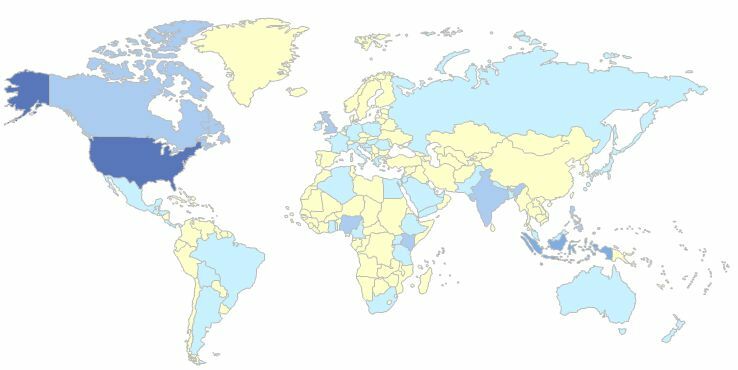 The darker countries are the ones which have accessed the site in larger numbers. I think that this map makes the world look like a small place. As I'm sure all of you know, a catastropic earthquake struck Haiti. There are estimates of as many as 500,000 victims. I am not sure what words could accurately describe this tragedy. There is a video on the American Red Cross website and information of how you can help. If you're going to make a donation, I would encourage you to do so over the phone instead of mailing a check (time is crucial). You can also text HAITI to 90999 to donate $10 to the relief efforts (the $10 will be charged on your cell phone bill). I have read reports of how medical workers from many, many different countries have volunteered to help Haiti. I then wonder and think... if these efforts were all coordinated with all the healthcare workers communicating together, then the efforts would probably be more efficient and more healthcare workers would go help (since they could go in teams). I hope that as the 100s of visitors turn into 1,000s that this website comes to a point where it could be a major source of help in the uneventful case of another disaster anywhere in the world. First of all, you might have noticed that my name is a little weird. How do you pronounce Marijan Pejic? Well, both “j”s are pronounced like “y” and the “c” is actually a “ć” which is pronounced like a “ch”. I was born in former Yugoslavia in 1989. I came to the U.S. under a refugee status in 1999. I realized at some point that I have opportunities in life that people who were born in the same hospital as me do not have. That is a motivator for me to do my best in school, to stay healthy, and to give back to the world. You can easily guess in which category the creation of this website fits in. I’ve put a massive amount of time and energy into creating this site but if it encourages one more healthcare practitioner to volunteer and thereby saves one more life, then I think that it was all worth it. I think that the conference deserves this. IMVC.org (in its latest edition) has been up for a little over a week but has been accessed in 23 different countries. There have been hundreds of visitors. People from colleges, medical schools, and hospitals across the country and across the oceans have visited. My hope is that the traffic on the website will continue to rise as rapidly as it has so far and that all members will share the existence of this website with their friends. This site is not limited to just medical practitioners. All people who support the site and/or would like to learn more are encouraged to join the website and the Facebook group. The plan is for this website to be used for the next conferences and to spread the spirit of medical volunteerism long after the first conference is over. I also hope that the members will become more active on the Forum. Don’t be shy. This website has already been accessed by hundreds of doctors and you’ll never know who would be interested in joining or starting a medical mission with you. I plan to create a forum in which members can recruit interested and eligible students to go follow them on missions (I would expect for the student to cover his or her own travel expenses). My hope is that the amazing medical volunteers who already are members of the site (yes, I have read your bios and all the collaborative book entries) can inspire the students of today to be the medical volunteers of tomorrow. If you have any suggestions or comments, I’m an email away (marijanpejic@yahoo.com). I look forward to the conference that will start a tradition.